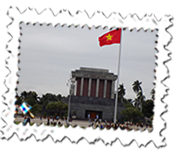 In my quest to visit countries which I have not previously gone to, Vietnam was on this year’s list. It made sense to return to India after a two-year break en route so the trip started in Delhi with a visit to my friend, Rajesh Kumar, and his family. The Indian Government had pulled a surprise by suddenly taking out of existence the Rs500 and Rs1000 notes to eradicate fraud. 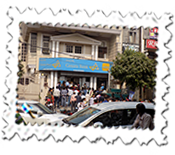 Doubtless worthy ideas but it would have helped had the new notes been printed at the time of the change as money was in short supply and anywhere where there was a bank, there was a queue. People had a couple of months to go to the bank to change their out-of-date notes and substitute them but Rajesh’s son told me that people could queue for up to five hours and there was no guarantee that they would be successful. It was frankly far from ideal. Another chap said that he could change money for me but would charge 50%... He asked if I were interested and was not greatly surprised when I told him that it was not really worth my while, was it? I eventually changed money five days later in Visakhapatnam Airport at a commission of 8% and, my hands on the new Rs2000 notes, no-one then had sufficient change. A Madras hotel gingerly offered me a Rs1000 note as change and we both laughed at each other. In the big scheme of things, it may prove to be a wise move by the Indian Government but the short-term results were chaos and I had hoped that my return to India would be more interesting than looking for money. I am grateful to the Delhi hotel ( Neptune Residency in Paschim Vihar) and friends for very kindly accepting pounds (at good rates) for my payments. It was probably just as well that my time in Delhi was a quiet one. It was nice seeing Rajesh and his family after two years and especially meeting the family’s new arrivals: Anshu’s son Ayaan and Gaurav’s son, Divyam, who was at that stage nameless. Sadly, I was in Madras at the time of the naming ceremony. After Delhi, I went briefly to Bangalore en route to Visakhapatnam in the hope of seeing a friend but this did not happen so I was at a bit of a loss but fortunately not for long. I enjoyed as usual a very nice meal in the Bell Hotel and Convention Centre. I tried to change money in Bangalore also but with the same results. The reason for my visit to Visakhapatnam was twofold. 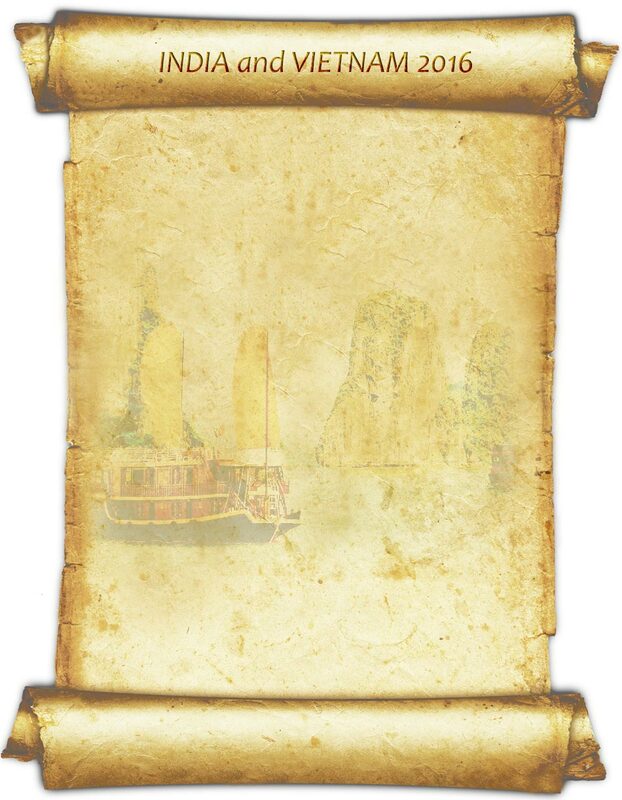 The main reason for going was that my late father had been there several times with the Merchant Navy and, considering that this was my thirty-ninth visit to India, I felt rather ashamed that I had not previously been. That now corrected, I feel much happier at seeing the port where my father would have worked. 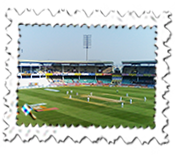 The second India and England Test was also being played so, although I had only twenty-four hours there, I made sure that I saw the first session of the second day’s play. It is a nice stadium and tickets were readily available – in no small measure due to the monetary woes: I read that they were given out free on the first day - so I paid just around £1.20p for my morning’s entertainment in the cheapest stand. I left for Madras by the overnight train from Visakhapatnam in the evening. It was on time and comfortable and, although I had the lower, side berth, I managed to change to the top berth. There are rules on Indian trains that those occupying the lower berths must allow those on the top to sit on the lower ones. I rather fancied just reading and sleeping and asked the chap with the upper berth if I could take his berth until such time as he wanted to move upwards, so to speak. He was fine about this but never asked to move and, by the time I woke in the morning after a fair night’s sleep, he had long gone. The train arrived into the Central Station early and I fairly quickly found the Central Residency hotel where I stayed. I found them rather more quickly than they found my reservation, though, but they had a room and accommodated me. The Rs1000 room (approximately £12) was fine although the shower head disintegrated when I tried to move its head. I have always seen Madras as my spiritual home in India having been there on probably thirty occasions and where I was introduced to India thirty years ago by my cousins. Things have changed and, sadly on this occasion, the excellent Landmark bookshop had, in the words of a worker nearby, “totally closed three months ago.” It was one of India’s best bookshops. I did, though, enjoy a beer in the Opal Inn’s Crystal Bar: this has been a favourite haunt for thirty years ago and there was still someone there who recognised me. It may not be that cheap now but the snacks accompanying the beautifully chilled beer made it a treat yet again. The travelling was beginning to take its toll on me – mea culpa – and I knew very well that a flight at 8 a.m. to Kuala Lumpur was unlikely to help. An autorickshaw at 5:15 a.m. was actually wonderful going past old haunts en route to the new airport. Air Asia’s flight was good and I had three emergency exit seats to myself and arrival into K.L. was on time at 2:30 p.m. I took one of the airport buses into K.L. Sentral: having paid for this ticket in advance, it was a little bit of a palaver relying on a boarding pass to gain entrance but it worked on the bus which I had considered least likely to accept it. A bonus, possibly. I stayed close to the K.L. Sentral in the Hotel Prescott which was good value and pleasant. With my room number 8423, I headed for the eighth floor but soon realised that the first 8 is superfluous so went to the fourth floor and quickly found my nice room with decent views. I rather fancied Malay food but, with one of K.L.’s sudden deluges soaking me, I ended up eating Indian near the Sentral Station. Vietnam for the first time was fascinating. 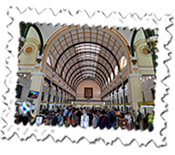 With British passport holders now not requiring visas for this period, immigration was quite easy and straightforward at Ho Chi Minh City. I cannot say the same about money, though, with 27,500 Dong to the pound. I had heard about the scams so scurried off to a corner to double check that what had been given to me was correct. It was. Such vast figures, though, do keep your mind active but it was fine and at least Vietnam had notes! 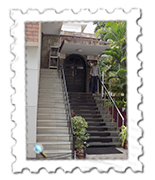 I took the airport bus to Quarter 1 where I was staying but initially could not find the Eden Garden Hotel where I was staying. I found a place which looked similar to the photo I had but, despite it being the same number, I soon found out that most Vietnamese hotels had a similar layout. Pointed further down the road, I did eventually find the Eden Garden which was a very nice place. I was to find that all the places I stayed in were most friendly and helpful and the standard of accommodation for a moderate price was very high. I was aware that there might be a trick or two along the way and nearly fell for one person’s wiles when asked where I came from. Inevitably, he had a friend in England. Inevitably, he had a book portraying nice words written by this Englishman and he had a motorbike which he would use to take tourists around on at doubtless high prices. ( It reminded me of Agra many years ago when a chap called Ilyas Khan produced a book with kind words from his English friend. I chuckled when reading that the tourist had written that “Ilyas Khan is a rogue but a loveable one.”) Within five minutes, I had been further stopped twice and, after being asked where I came from, told them that I knew of the book and the motorbike and was walking. It seemed to work. 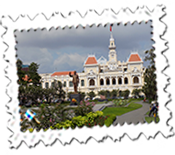 The main historic sights of Ho Chi Minh City (or Sai Gon) were more or less in the same, general area. Statues and portraits of Vietnam’s legendary leader abound and Ho Chi Minh Square was most impressive. It’s a funny thing but, around the main sights, there were very few seats but hey ho: it was probably me just breaking out in a bad cold. 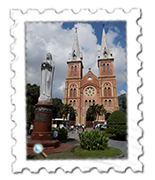 Notre-Dame Cathedral – designed by Gustav Eiffel – is a lovely place and adjoins the Central Post Office, an impressive building which sells souvenirs and stamps with Ho Chi Minh’s portrait surveying proceedings. I went a little out of my way afterwards simply because it was so difficult crossing one main road near the water. I rather enjoy the challenge – sorry, a horrible word but one befitting Sai Gon’s roads occasionally – of crossing Indian and Vietnamese roads. There is an art to it: quickly, slowly, waiting to take one’s chances and it’s not always for the faint-hearted but nonetheless quite fun. I am happy to take on motorbikes and, at times, buses but less so cars. When I did make it across, an envious elderly English lady congratulated me and I wished her well getting across in the opposite direction. When I turned round, she had marched into the thick of the traffic, hand firmly outstretched at the oncoming traffic and made it over far more easily than I had. It was a remarkable sight. I ate well opposite the Eden Garden. The prices were frankly unbelievable and, having far too few fingers to work out the price easily, relied on a cheap calculator. Two halves of beer, the local Pho dish and a further chicken dish cost just under £7 and that, on my part, was being greedy. I moved on to Ha Noi the following morning. It was a shame as, not feeling 100%, I was looking forward to a flight at 10:15 a.m. only for it to be moved to 8:55 a.m. Another early morning which I could have done without but the VietJet flight was very good. I had taken a taxi to the airport rather than the slower but cheaper bus and everything was smooth but, again, I spent far longer than necessary waiting. I took the Vietnam Airlines bus to the Mai Charming Hotel which worked well and I was dropped just a minute’s walk from it. The hotel was one of the friendliest which I have ever stayed in. The manager, Jerry, was extremely helpful and knowledgeable whilst Daisy had been most helpful in helping me re-book a cruise around Ha Long Bay. I had booked through booking.com initially and received numerous emails requesting information only to find it almost impossible to elicit a reply from the sender, a Miss Thu. Miss Thu was certainly a mystery but these problems were quickly overcome when I cancelled the booking.com reservation and Daisy re-booked it at a lower rate. Daisy was a delight to deal with: on the Sunday morning which I booked the cruise, Daisy became less formal with every email. Starting with “Dear Andrew”, it soon became “Hi Andrew” and finished with “ Cheer Andrew” and the word ozhe which Google Translate couldn’t help me with. Daisy also cooked very good boiled eggs at breakfast! A slight problem was Jerry telling me that a typhoon was expected in Ha Long Bay and, whilst the trip might go ahead, would I share with someone? I took it that this meant other people needing to be re-booked but, whatever, I wasn’t prepared to do this – years of boarding school put paid to that notion as well as the possibility of giving someone else a bad cold – and nothing was mentioned further. Ha Long Bay is one of the most popular places in Vietnam. Renowned for its large, pinnacle-like islands rising from the waters, it reminded me of a similar area in Thailand where the James Bond Island is situated. 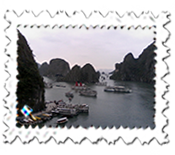 Both areas are extraordinary and Ha Long Bay has hundreds of islands and vessels ferrying tourists around. It must be worth their while given the number of boats plying the islands. China is little over an hour away. One aspect that cropped up, though, was that, on the bus to Ha Long Bay, our guide who called himself Peter, mentioned that no alcohol was allowed on the boat. Okay, I had heard that cruise liners place this restriction on its guests but it came as a shock that little more than a small launch insisted on this also. I hadn’t read about this so, with a bottle of gin in my bag, I decided that the best course of action was to go on the ship last and, if checked, surrender it to save embarrassment. Anyway, no-one checked so all seemed fine. Peter was a delightful chap but prone to repetition. Our group was predominantly young, a bit dishevelled and I thought a motley outfit. I’m happy to say that I got it wrong and all were most friendly, predominantly European and all, without exception, spoke impeccable English. I was most impressed by that, their friendliness and good manners. One chap, though, amused us whilst listening to Peter tell us about one of the included visits to Ti Top Island before the evening meal. We also visited Thien Cung caves. Thien Cung. 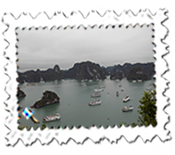 Both Thien Cung and Ti Top were interesting places but Ha Long Bay is a popular tourist cruise and accordingly there are lots of tourists converging upon both places. Still not feeling 100%, I hadn’t been listening as avidly as I should have been to Peter and agreed to the next activity until told it was kayaking. I soon pulled out feeling rest would be better than a potential wet dip and returned to the cabin. Whisper it quietly but I was later enjoying a gin and tonic when there was a knock on the door and Peter and, it seemed, all the crew were outside for a, shall we say, routine inspection of the shower. 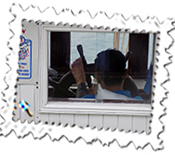 Read cabin inspection. “ I smell something, “ Peter blurted out. Indeed he did. I reasoned that gin doesn’t smell but TCP, which I had taken for my throat just minutes before, does so I was happy to produce the bottle (whilst hiding the offending gin glass) and they went off, well, probably still suspicious. Nothing further happened and I didn’t dare ask if anyone else had had such an inspection. The captain was a laid-back chap. Literally. Reclining in his seat on, if you like, the bridge, he played with his mobile phone whilst steering with his feet. No-one felt at all nervous, just curious and he certainly gave no cause for alarm. I could have done without another early start to Ti Top Island – remember that place? – but it was worthwhile although there was later some hanging around to dock and then the bus. The trip to and from Ha Noi takes around four hours and inevitably includes a shopping stop which was way too long but never mind. Despite the dreary weather, the trip around Ha Long Bay had been fun and the typhoon didn’t materialise. 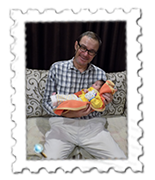 Arrival back into Ha Noi was around 4:30 p.m. and a very nice welcome from Jerry, Daisy and Maria, the receptionist. 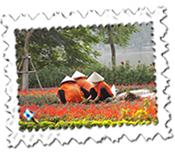 I enjoyed my time seeing the main sights of Ha Noi. Sadly, I had the right day but the wrong month to see Ho Chi Minh’s body, the mausoleum being closed in October and November. The mausoleum itself is impressive as is the general area which houses the Presidential House and Ministry of Affairs. There is security but it tended to be polite and not overbearing. For once my dreadful lack of direction – I followed the map and ended up in the south rather than the north – bore fruit as I turned up later than planned but exactly at the time of the changing of the guard which was an interesting spectacle. The newly-arrived guards were inspected and their uniforms straightened: whether this always happens, I cannot be sure but they certainly did not look at all scruffy. As I was flying out that evening, I rested as best I could before my evening departure and enjoyed a decent meal opposite the Mai Charming. Last minute shopping also wiled away the time. Maybe I should not mention it but the gin bottle also gave me further trouble, this time after stretching round for my drink and putting my back and leg out! I thought that it would be a five minute inconvenience but it was anything but and, a fortnight later, was I only feeling better. I must be getting less mean as I decided to take a taxi to the airport rather than rely on an airport bus from central Ha Noi and it certainly made it easier. I could swear on arrival that the check-in chap told me that I had been upgraded but the boarding pass didn’t back it up and, whatever, it was a mistake sadly. Although I felt that I was getting over the lurgy, the twenty-hour trip back via Dubai made me far worse. The flight from Ha Noi to Dubai had a stop in Burma in the middle of the night which was not the ideal time and it was a fairly difficult journey all told with my eyes swelling up from Dubai. I made it safely even though the journey back to Swindon was precarious with late trains and the possibility of a two-and-a-half hour wait at Reading. Mercifully, I caught a delayed train just as it was due to depart so avoided a cold and long wait. I was due back at work the following day but felt so ghastly that it was only Friday when I could re-appear. 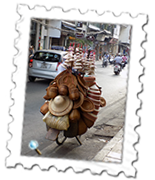 Vietnam, though, had been fun and was another country which was ticked off the list.